This Honey Wheat Homemade Bread is my absolute favorite because it is so moist and doesn’t fall apart. I smother it with honey butter when it’s hot! This Honey Wheat Homemade Bread is my absolute favorite homemade bread because it is so moist and really holds its shape. You know how some breads break apart when you cut them? This one never does. My friend used to make this bread when we were going to school in Idaho and I really loved it. She was one of those people that would make it without having a recipe so I made her measure it out one day for me. I usually make it with white flour for a yummy homemade bread but today I decided to try whole wheat flour and it was really good too. You still use the honey either way. The quality of wheat makes a huge difference in baking wheat bread. Hard Red Wheat, Hard White Wheat, and Soft White Wheat all make delicious wheat breads. Grinding your own wheat will give you the most nutritious wheat bread. You can also purchase freshly ground wheat flour from a flour mill or wheat flour from the grocery store. Much research has been done to evaluate the benefits of wheat bread over white bread, and the benefits of using 100% whole wheat products. When you purchase bleached white flour, you are purchasing wheat that has undergone so much processing that very little to none of the vitamins and minerals found in whole wheat remain. When you grind your own wheat, you can be assured that all of the nutritional value is still in your flour. If you have picky eaters at home that won’t eat wheat bread, try using 1/2 unbleached white flour and 1/2 whole wheat flour in this recipe. You won’t be able to tell the difference – and neither will they! The bread will have a lighter color and texture than whole wheat bread, and you will still have a portion of the health benefits of whole wheat. Add flour a cup at a time until you have a soft dough. Knead and put into a bowl. Cover with a cloth and let raise about an hour or until it has about doubled in size. (It raises much better if you put in front of a window with the sun shining in or on top of a warm oven). Knead again and place bread into baking tins and raise again for another hour. Bake at 350 for 30 minutes until brown on the top. Butter the top of the bread while still in the oven and let cook another 2 minutes. Remove and let cool about 10 minutes in the pans. Turn out and cool for 10 more minutes before slicing. Makes 3 regular or 2 large loaves. Is there anything better than a warm slice of homemade bread? Here are some more of our favorite bread recipes. 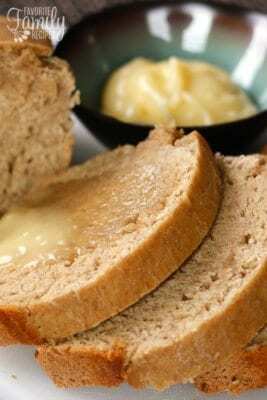 Irish Soda Bread – This authentic Irish Soda Bread is perfect for St. Patrick’s Day. It is easy to make. The bread doesn’t have to rise and there is very little kneading. Subway Bread – This bread works great for Subway sandwiches. It is soft, slightly chewy, and has a fresh, homemade flavor. Zucchini Bread – This is our Mom’s no-fail recipe for zucchini bread. A moist, flavorful bread with a slightly crispy crust. Rosemary Parmesan Focaccia Bread – The perfect dipping bread! It is delicious dipped in olive oil or as a side for soup. Sally Lunn Bread – A sweet bread recipe that has been passed down in our family for generations. Your bread looks great a honey butter yumyum. We make bread every week and I love trying new recipes!! I have been trying all morning to get my yeast and warm water to froth and it's not frothing to save my life. Do you have a certain technique. I even added a little sugar to the mixture to help activate the yeast. I did test my yeast in another bowl with little amounts and it is active. So the 3 cups isn't too much water to add with yeast? Proof your yeast in 1/2 warm water then add it to 2 1/2 cups warm water. I had the same problem. I add a teaspoon of sugar to the water and yeast mixture and it froths just fine!! I also used active dry yeast (traditional)…. I have run into problems when I have used the wrong yeast and then my recipe doesn’t work. Thanks for the bread recipe – super good! @Mandy- Make sure your water is REALLY warm, almost hot. As long as the yeast is activated you should be fine. Your bread looks utterly delicious. I would like to make this but could you clarify exactly what shortening is, I’m guessing it is either hard margarine or maybe lard? You can find shortening in a container in the baking isle of the grocery store. It’s not refrigerated like butter. It’s stored on the shelf. Sorry, I forgot to mention I’m from England so I’m pretty sure this doesn’t exist over here. You can definitely use the same amount in butter instead of shortening and it will work fine, it will just taste a little different. In the UK it’s sold as brand names Trex, Flora White or Cookeen. 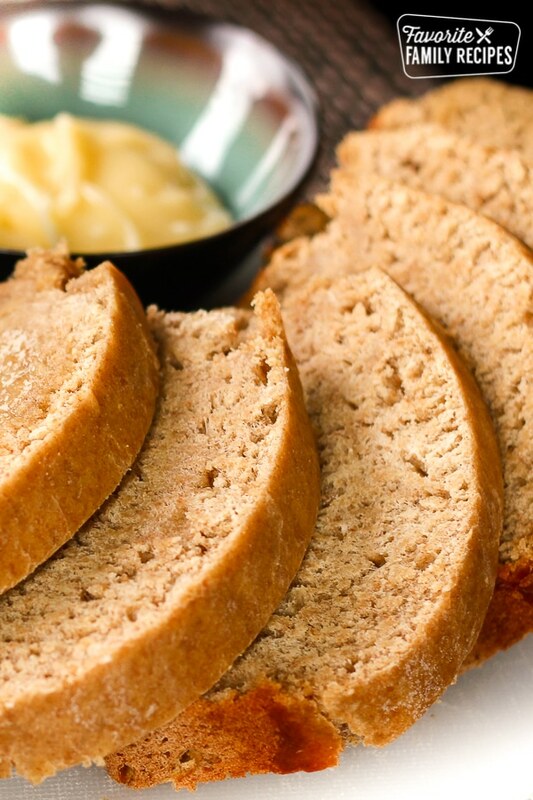 Do you use all whole wheat flour or a mix of white and whole wheat? I have done both, I like it with the mix of white and wheat. Do you do an equal amount of white and wheat when you mix the two? Yes, but you can’t go wrong. Any way you want to mix it will work. This sounds so good! Can you half the recipe? We don’t eat a lot of bread so I don’t want it to go to waste. Just out of the oven. Very very good!!! Have you tried making it in a bread machine? If so, what alterations would you make to the process? Thanks! Amy, I’m curious to know if this worked ok in your bread machine, or if you had to cut the batch size? Wondering if there was any update for us bread machine users?? I Just made this and it turned out amazing! ! Thanks for making my first go at making bread easy! I’m just starting to learn how to make bread and I was wondering if it mattered what kind of dry yeast to use? I usually get the yeast in the little packets. Do you use Rapid-Rise yeast or Active yeast? Both come in the little pouches. Just mixed up 1/2 the recipe (used butter instead of oil) in my bread machine on the “DOUGH” setting, let rise in the loaf pan and then baked in my oven. Turned out really, really good! Thanks for posting the recipe! I have been trying to master the art of making homemade bread, but not having much luck. I am following the recipe exactly, either comes out too dense or in this case I tried your recipe and even after adding 7 cups of flour still not dough consistency more like really thick cake batter, added more flour and still no go…. What am I doing wrong?????????? Make sure you are giving it plenty of time and a good place to raise. Density issues usually have to do with that the bread didn’t raise enough before baking. You want it to really raise up out of the pan before sticking it in the oven, and when you do, put it in the oven gently so it doesn’t deflate. This looks great! I have never made bread before. I am assuming you use wheat flour? Is that what makes this “honey wheat”? Yes – thank you for your comment! I changed it to “wheat” flour in the recipe, but it can also be made using white flour. I definitely prefer the wheat flour especially if you grind your own. I found some hard white wheat at Costco that is fabulous when making bread. It is “Lehi Roller Mills” hard white wheat. did some of your instructions disappear? it doesn’t say what you do with the yeast, and I am a big time bread rookie! Sorry, it’s a little confusing, the first instructions are up with the ingredients. Yay! I’m so glad it turned out for you! I love this bread! Made this and loved it! Just curious though, what’s the best way to store the loaves? You can store them on the counter if you are going to eat it within a week, in the fridge will make it last a little longer. Or you can slice the loaf and freeze them if you want it to last even longer. Made this bread today and it was wonderful. It was so easy and tastes really great. I used butter instead of shortening. I halved the receipe and made one loaf. Will be making more soon. I am trying this recipe today and I am super excited about it! Just one quick question for you — what is considered a “large” pan and what is considered a “small” pan. I’m trying to figure out if I should divide the dough into two or three pans. The large is a regular size bread pan. The small is about half that size. I haven’t tried your recipe yet however I have tried a few others. They are always delicious right out of the oven but crumble and fall apart when I try to make sandwiches a few days later. Can you give me any insight on why my bread always ends up dry? I look forward to trying your recipe. It is also the first that I will be trying with shortening so I hope that helps! new to bread making the bread pans are nonstick , grease and flour or leave alone? I still grease and flour non-stick pans. It’s not worth losing a loaf of bread if it sticks. Thank you for asking! we just sampled it, tastes great, I did need more than 7 cups flour though, dough was wet added about a half more cup and that turned out just right ! I’m so glad it turned out! The amount of flour you need in bread recipes varies just a little depending on your elevation and the humidity in the air. You were wise to add more flour. made this yesterday, probably the best texture ever! Yummy! I am allergic to honey but I really want to make this bread for my husband, because he can’t eat white bread. What can I use to sweeten the bread without using honey? Thank you. You can use sugar – white or brown – instead of honey. Thanks for asking! Or try using maple syrup. I made this recipe using molasses instead of honey because of my allergy to honey. The bread came out beautifully. The loaves rose out of the pans and had a lovely flavor. I will be making this bread again. My husband is so happy that he gets a homemade wheat bread that is soft and great for sandwiches. Thank you for this recipe. I am sorry Echo, I didn’t see your reply. I think I will use brown sugar the next time to see which recipe ( molasses or brown sugar) we like better. Thank you for your reply. My boyfriend and I moved from the U.S. to Australia about three years ago and we miss Nature’s Own Honey Wheat sooooo much that I finally broke down and tried making a substitute at home. Enter your recipe. It is delicious. I just made it, so we haven’t made sandwiches yet, but I can already tell that we will be quite satisfied with this bread. I mixed a bit of honey with melted butter to brush on top for the last 2 minutes… YUM! Welcome to the United States! I’m so glad you like this bread recipe. Also, thank you for adding your comments about the dough consistency. With bread, so much depends on altitude and humidity. Thank you! Is this a good bread for sandwiches? P.S. My water/yeast mixture didn’t froth at all and it still turned out fine. Also, the dough was very moist and sticky. Like someone else commented, I kept having to add flour until it was the right consistency. I didn’t measure the extra flour, but I’d guess it was a good extra cup. Just wanted to point that out for any other novices who worry how their bread will come out if their yeast doesn’t froth and/or their dough is too moist with the 6 cups of flour the recipe calls for. So it’s a “regular” loaf like a 9×5? I have made this a few times, and my whole family loves it. My 3 yr old will not eat sandwiches, UNLESS they are on this bread! I had it pinned, and also printed, and ended up loosing both, tonight I’ve been scrambling to find this again because we LOVE it so much, trying something else was not an option. That is awesome, so glad you love it! This bread is amazing!!! I did use 1cup white flour. I’ve made tons of bread. This is my very favorite. My family loved it. Thanks so much for sharing it. So glad that you liked it!!!! 😀 Thanks for the nice comment! This bread is everything you said it was. So good! Substituting SAF instant yeast for the packaged yeast. Do I use the same amount? Do I skip the second rise? I haven’t used that kind of yeast, I don’t want to tell you the wrong thing. Have you tried it yet? What did you end up doing? I’m anxious to try this recipe. Can you substitute canola oil for the shortening? If so, how much do you recommend? Thanks in advance! I haven’t tried that, if you were going to substitute, I would probably use butter. Hi! Just wondering, do you melt the shortening before putting it in the bowl? My husband requested homemade bread as he has been making homemade jam all day. Can’t wait to try your recipe! No, I don’t melt it. I made this today and it was so poofy! It rose very well, actually oozed over my bowl when I wasn’t looking! The bread itself is light, chewy crust, awesome honey flavor. I did the half white, half whole wheat flour. Thanks for the recipe! Instead of buying bread I now make this bread weekly! It’s the best bread I have ever tasted!! My whole family loves when I make this! Thank you so much for sharing your recipe! Anyone have any recommendations if I wanted to make this cinnamon raisin bread? I can’t seem to find any few ingredient, healthy whole wheat recipes for this and thought maybe I could modify it. I made this bread yesterday with my new kitchenaid, and it turned out wonderful! Thank you for this great recipe. It’s so simple and delicious! Any suggestions for a cinnamon raisin version would be greatly appreciated. Thank you! I live in India and made this bread today. Turned out perfect! Thanks for a great recipe. I halved it, used butter and half all purpose flour. Awesome. nice it makes 2 long loaves. I have been making white bread for years for my 6 children and once in awhile make raisin bread. Make this recipe and when you put half the flour in put in 1 cup raisins then knead in more flour as needed. I’m glad this recipe! Thank you for the tip when adding raisins. That sounds delicious! It could have been defective yeast or too hot of water. Hot tap water is usually fine, but yours may be extra hot. I was just wondering what type of salt you use in your recipe? The bread looks delicious – I can’t wait to try it! Thank you! What kind of salt did you use in your recipe? The bread looks delicious – I can’t wait to try it! Thank you! This bread is so good! I have been making it for a couple months now, alternating with some other bread recipes, but I always come back to this one. Great flavor and great texture. I use about 5 cups wheat flour and use white for the rest. Thanks!!! Is it necessary to cut the shortening into the flour? Cutting it in is a baking technique that helps the fats get evenly distributed into the flour. It just makes for a better base when making bread. Hope this helps! Can this be made using stand mixer with dough hook?